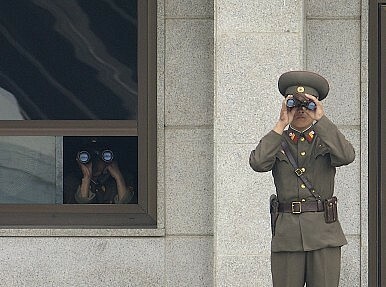 A North Korean soldier looks across the DMZ. South Korea’s propaganda broadcasting is a potent weapon, challenging the North’s monopoly on information. What was lost on many in the respite brought by tentative peace was why the loudspeaker systems are viewed as direct threats to Kim Jong-un’s regime. These broadcasts are seen as such a threat that the Hermit Kingdom upgraded in 2014 from C.W. [Morse code] jammers to tactical Multi-Pulse jammers in order to counter shortwave dissemination of Voice of Freedom. “South Korea can reach [with its broadcasts] military stations near the front line and North Koreans living next to the frontline” says Cho Han-bum, senior research fellow at the Korea Institute for National Unification. “The [Kim Jong-un] regime is extremely sensitive to the South’s loudspeaker broadcasting as it can reach all the way to Kaesong,” a city of a little less than 200,000 people. Spread from Gyodong Island in the west to Goseong in the east, South Korea has 11 loud-system broadcass locations along the DMZ. Playing between two and three times a day in three to five hour intervals, the broadcasts can be heard for a distance of 24 km (roughly 15 miles) at night and 10 km (six miles) during the day. As a Formula 1 car can be heard up to six miles away, we can estimate the decibels output of these nine meter (30 foot) tall speakers at about 147. For perspective, at 141 decibels you incur long-term hearing damage and feel physically nauseous within minutes. At 145 decibels your vision blurs due to eyeball vibration. North Korean counter-propaganda broadcasts try to drown out the sound, but due to aging equipment are largely unsuccessful. The genius of the broadcasts is that they non-violently undermine the stability of Kim’s kingdom by becoming reliable, trusted source of knowledge at the expense of North Korean propaganda. It starts with banal topics such as weather reports — defectors talking about how to deal with hot weather or giving warnings about coming showers and advising people take their laundry in. Then comes international news such as the happenings in Syria, seeding doubts of descent. As The Diplomat’s David Eunpyoung Jee notes, “stories of the Free Syrian Army give troops a chance to question their Dear Leader” and provide examples of people rising up against oppressive regimes. Furthermore, these broadcast actively encourage North Koreans — whether soldiers or citizens — to defect. Assigned to the western front before defecting, former North Korean soldier Ju Seung-young remarks that “[t]he impact was greater than you may expect,” because “[t]he South Korean loudspeakers were a rare source for news about the outside world.” Like many others “[a]t first, I thought their broadcasts were all lies. But after being exposed for two years straight, I began to believe it,” he added. Despite the loudspeaker being about 4.5 kilometers (roughly 3 miles) away, Ju distinctly remembers the messages could be clearly heard. South Korea’s ability to effectively erode North Korea’s Ministry of Propaganda and Agitation’s multi-decade monopoly on information is something that irritates Pyongyang beyond belief. If Kim and company are so concerned by South Korea’s loudspeakers, how will they respond as more and more North Koreans gain access to smuggled DVDs and USBs loaded with videos? Alexandre Dor is an editorial assistant at The Diplomat. Last summer, North Korea threatened military action unless the broadcasts were stopped.